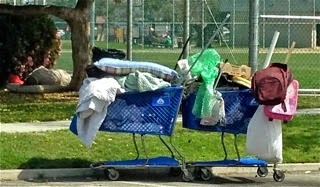 In a press release issued today, HERE, the City of Costa Mesa informed us that the efforts of the Neighborhood Improvement Task Force, as defined by its 4th Quarter Report - a 28 page document replete with lists of accomplishments and charts and graphs - HERE, has made major inroads with so-called "problem motels" and in the broader homelessness issue within the city. 710 citations were issued citywide for violations such as drinking in public, urinating or defecating in public, and smoking in a public park. The city inspected 14 motels in 2013 and issued 981 citations for various municipal code violations totaling nearly $26,000 in fines. 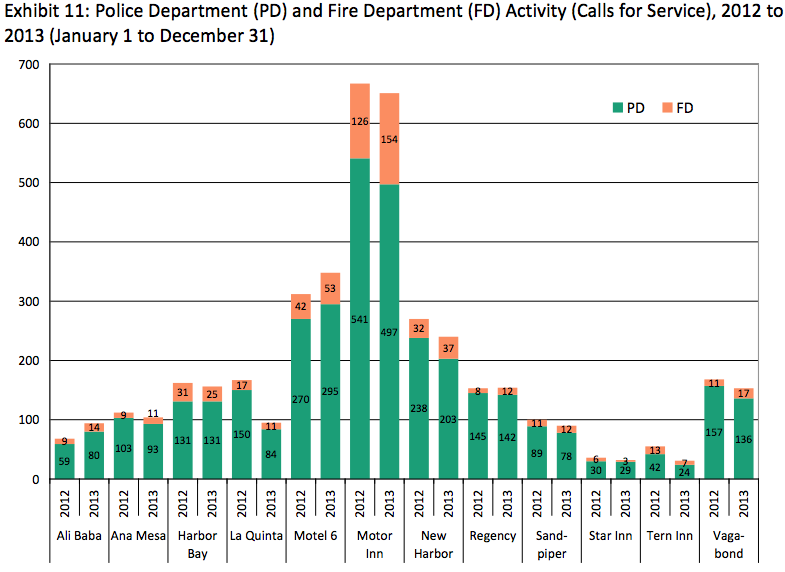 Among the 12 most problematic motels (in terms of calls for police and fire service), only the Ali Baba, Motel 6 (Gisler Avenue) and Regency Inn had increased in total public safety calls for service in 2013. The Ali Baba had the most significant increase at 36%. The remaining motels had decreased police calls with the La Quinta Inn and Tern Inn having the most significant drops at approximately 43% each. Police officers made nearly 1,700 patrol checks of Lions Park. City staff provided homeless persons with 194 connections to various governmental and private-sector services, including rehabilitation. This is great news and all parties involved are to be commended. It makes one wonder just how much more might have been accomplished if our public safety organizations had been properly staffed. I wonder really though, if the drop in calls is due to the owners/managers not wanting to be fined, so they don't call the police when maybe they should. That would be problematic in itself. Because, frankly, I'm not seeing anything in that realm get better. In fact, I'm seeing more of a mess than ever before with regard to drinking in public, smoking in the park, especially Fairview Park, and people passed out drunk on private lawns. Is this the same type of stuff that tells us that all the money from the 60th was accounted for? So, to me its just like everything else, you have to prove it with more than just a cheap graph. Where's the graph of the police calls to bars? If the fee applies only to motels and not other businesses, I see a lawsuit on the horizon. But that's Jim's way of doing business. The only reason we see less calls now at Lion's Park is because all of the park rangers and ambassadors are now stationed there. No need to call. They are fooling no one. Now Fairview Park is under siege from gangs, along with the area across the street.